Inclusion is an important, yet nuanced, subject, especially within the realms of career development. At the Puget Sound Green Infrastructure Summit, a City Habitats’ event convened by Stewardship Partners, held at Cascadia College in Bothell on February 9th. Inclusion was discussed at length during the keynote panel entitled “Building the Diversity of the Green Infrastructure Field.” People of color represent 36% of the population and comprise 29% of the science and engineering workforce, but they do not exceed 16% of staff in any environmental organization surveyed, highlighting a green ceiling that exists within this work (Green 2.0). Over the next 20 years, the percentage of people of color in the U.S. population will grow to over 50% (U.S. Census). To be effective, this green ceiling needs to be addressed. Within the panel, speakers shared inspiring ways in which they were building the diversity of the conservation field – and, more specifically, the green infrastructure workforce. All of these programs, though dissimilar in their target audiences, align through their goal of working groups of people who feel out of place. They provide a sense of place for these marginalized communities and show that the people are just as important, if not more important, as the work that is being done. 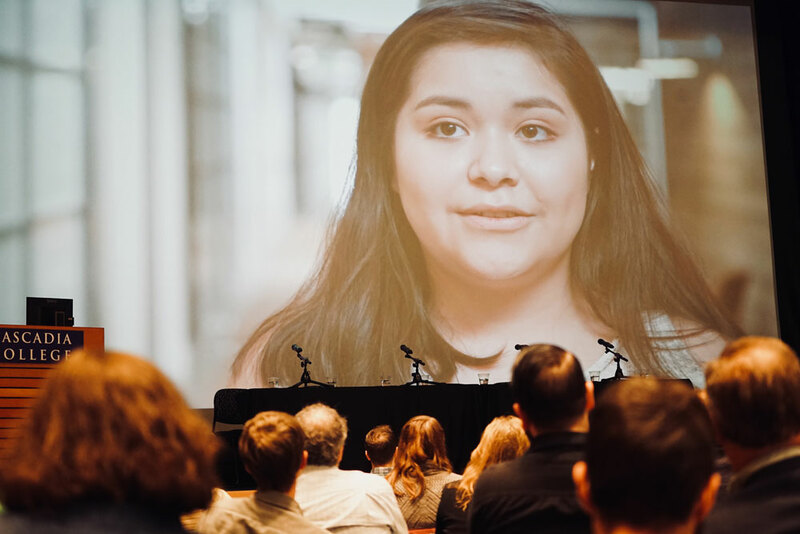 The panel appropriately began with the voice of the youth captured in one very special young woman, Daniela Cortez, a youth mentor for Duwamish Valley Youth Corps (DVYC). She shared about how in her past, she was so unaware of the environmental hazards in her neighborhood of South Park, Seattle, which buddies up to the Duwamish River, a Superfund site but then “woke up” to the many environmental threats endangering her neighborhood. Due to her age, heritage, and gender, Daniela never believed she had a voice, but the DVYC gave her a way to act on what she was seeing and to make a difference in her community. Founded in 2014, DVYC aims to build the leadership of resident youth in taking action for community health and revitalization in Duwamish Valley. In addition to proximity to the Superfund site, air quality is remarkably low in the valley and life expectancy is 13 years shorter than those in wealthier areas of Seattle. 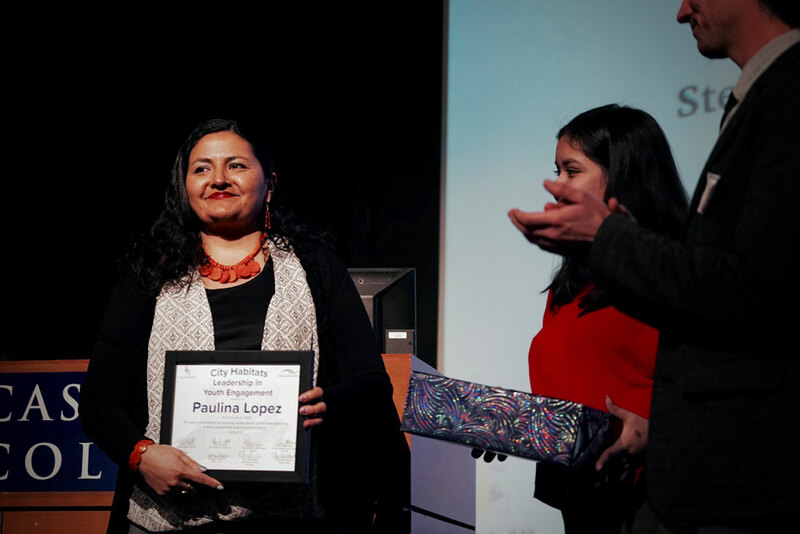 Paulina Lopez, the Duwamish River Cleanup Coalition’s Community Engagement Manager and coordinator for DVYC, is also a resident of South Park and shared that this community thinks asthma is normal. DVYC supports youth to feel empowered to speak up about this and other challenges as well as take action. 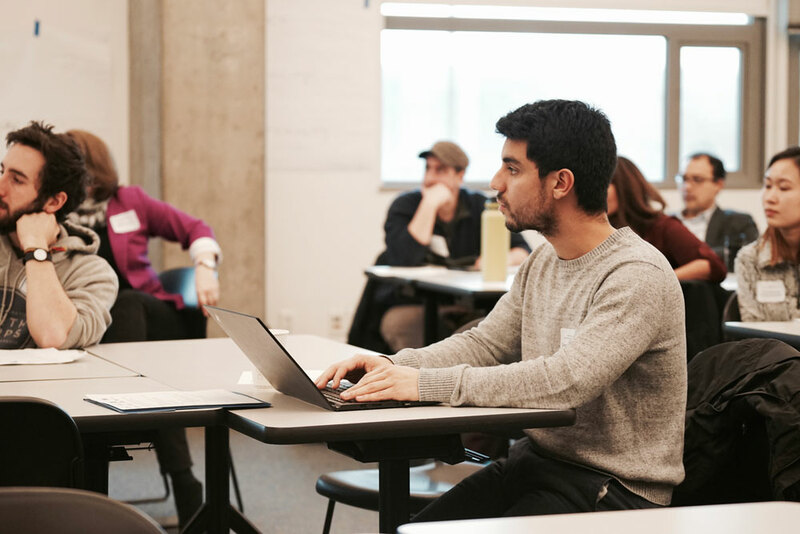 It provides programming that employs and educates Duwamish Valley youth during a 12-week paid program with 80 hours of both empirical and experimental education that benefits the community while training these youth for careers in the environmental sector. Jasmine Davis, Seattle Aquarium’s Community Partner Program Coordinator, was also present on the panel and highlighted matters of inclusion. Jasmine runs the aquarium’s Connections Program which is designed to more effectively engage Seattle’s urban community, reaching out to communities that have historically not had a voice in the conservation movement. In the past, the aquarium simply distributed free tickets to marginalized communities to encourage attendance – but the aquarium realized this was not enough. In developing the Connections program, Jasmine really wanted to understand the barriers, perceptions, and the needs of her audience. She described it as “cooking an elaborate chicken dinner and finding out they’re vegetarian.” It’s a waste of time to put so much effort towards something without knowing anything about who you’re attempting to cater to. Claiming that raw nature is the only option for conservation is counterintuitive when working with urban communities; it implies their life and way of living is unnatural and wrong. Partnering with organizations like DVYC and others helps the aquarium to understand the urban context and raise conservationists in the city. By taking institutional racism and social inequities into consideration, the Seattle Aquarium is able to elevate youth voices and empower urban communities, broadening what ocean conservation looks like and who it represents. The Duwamish Infrastructure Restoration Training (DIRT Corps) program is focused on engaging young adults 17+ from underrepresented communities such as women, people of color, and LGBTQ, to jumpstart them for careers in green infrastructure. Cari Simson, the founder of DIRT Corps, developed it in response to a need she saw in the growing green infrastructure field as well as the Duwamish Valley specifically. The program, as it is today, offers both classroom and field experience over the course of eight weeks that covers urban forestry, ecological restoration; and rain garden and cistern design, construction, and maintenance. Recently, the program has incorporated vertical mentorship to support continued job skills development around project coordination, community engagement, and specialized urban restoration skills. The final presentation, provided by Derek Hann, an engineer from the Snohomish Conservation District, highlighted a slightly different side of inclusion in workforce development. When looking at a need for an expanded green infrastructure workforce, Derek thought of an idea – veterans could have the perfect mentality for this work. So, he went about partnering with the Veterans Conservation Corps to train veterans on green infrastructure projects. While trust and the transition back to civilian life can be a challenge for veterans, small vet-only teams can be a place where they can feel comfortable and soar. With their refined hardworking skills, one team of four vets were able to build 40 rain gardens within one year. Working with vets does come with its challenges. Derek mentioned how transportation, absences, mental health, trust, and recruiting (because of trust) were all major hurdles within this endeavor. However, unique hindrances were far outweighed by exceptional advantages, such as hard and fast workers, remarkable skills, support from the Department of Veteran Affairs (VA), inimitable perspectives, and outreach benefits. Derek works primarily with private land owners in conservative regions; the veteran crew workers were able to connect with these land owners on a more personal level and persuade them to install rain gardens. This work is mutually beneficial to both sides; the workers are able to work with fellow vets which helps them transition to civilian life together, they have more access to VA programs, they receive invaluable ecotherapy to assist with any mental or physical ailments, and they get on the job experience to aid them in future career ambitions. As a young person of color, many of the experiences during my ‘career’ were represented at the summit. This was most reflected in the video interviews of high school aged youth of color shared at the start of the morning panel. Their thoughts and experiences resonated with my own. The fact is, while each person has a unique path – their overall experiences are not one-off but are themes that are continually felt – including: lack of experience, representation, opportunities, access and cultural differences. 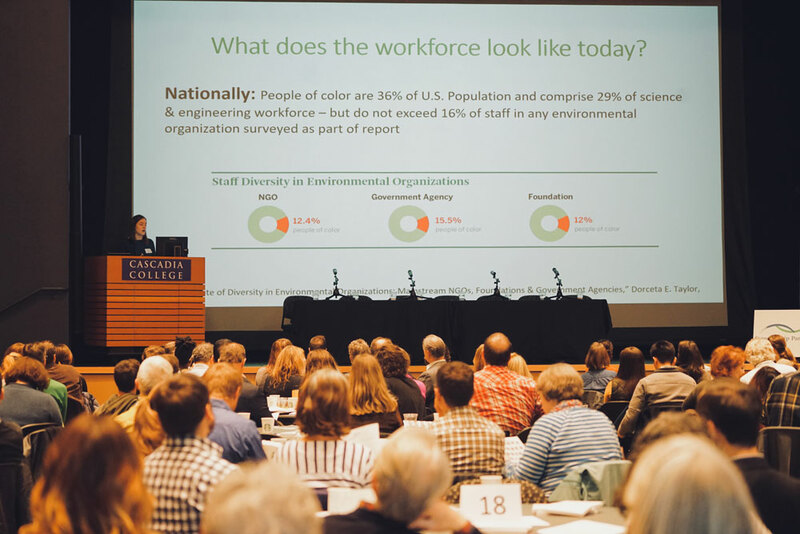 Part of the challenge when looking at shifting the diversity of the green infrastructure workforce is the internal barriers that people of color face. Although there may be strong interest in conservation, they do not think they have the right experience, fit the mold of a ‘conservationist’, and don’t see people who look like them in the field. These issues are compounded by the fact that there are no clear pathways into conservation for youth – especially urban youth. There also lacks mentorship and guidance for those that have already entered the field. In the afternoon, I helped lead a breakout group around youth mentorships/internships/jobs. What made this session fruitful was the chance for the participants to share about the internships or fellowships that they know of in which middle-schoolers, high-schoolers and college aged students could apply. Many were paid positions which addresses a key barrier that can deter low income and people of color. Participants also shared about other barriers that are often unseen or not spoken about – including the lack of jobs that don’t require a social security number, jobs that cater to people with disabilities, and jobs that don’t require a high-level of English language requirements. These types of barriers are often left out of the conversation on green pathways. Once we become aware of the challenges faced by marginalized communities we will have a better idea as to where to find the best employment opportunities for them. The summit and breakout group was a respectable foundation for moving forward on a unified effort. One participant has been compiling resources and data that can assist youth in figuring out the best way to get their feet into the door of a career in conservation. The resources include a list of available internships, jobs and fellowships; a list of different entry-level, mid-level, and high-level green jobs; a description of qualifications that employers are looking for; and many other resources that could help guide youth into green careers. These types of tools have the potential to be useful for many individuals. Going forward, we must continue the conversation and ensure that there is continued momentum in giving employment access to youth and youth of color.